This has served as the rallying cry for more than 3,000 Lowe’s volunteers who have served with Rebuilding Together for the past eight years. 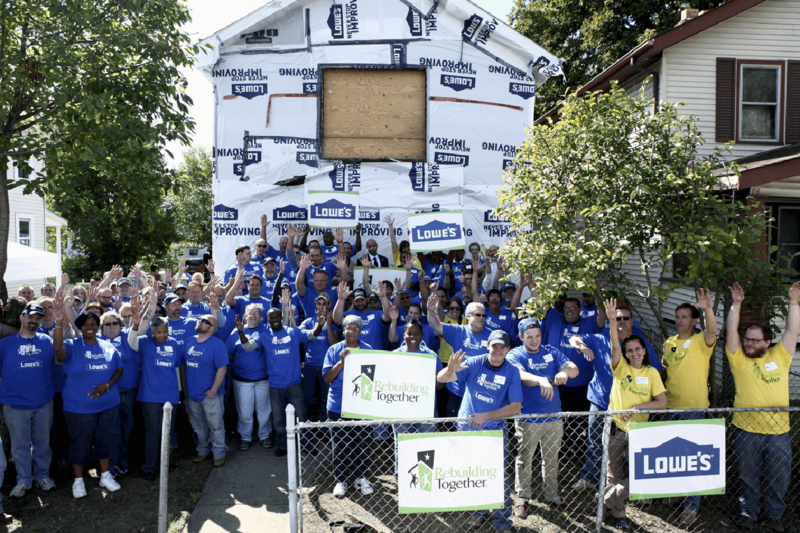 Since 2007, these volunteers — from local Lowe’s stores around the country — have completed nearly 1,500 rebuild projects on homes, nonprofit centers and community spaces. Donating more than 29,000 hours of labor, Lowe’s Heroes have positively impacted more than 14,500 lives nationwide. 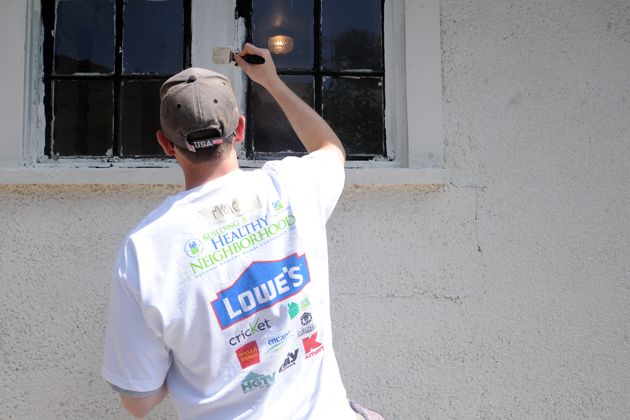 Lowe’s support is integral in helping to drive the mission of Rebuilding Together forward. Through volunteer work and the donation of rebuilding tools and materials, they have served as a partner with us on our annual Building a Healthy Neighborhood since our inaugural event in 2011. Through Building a Healthy Neighborhood – and working with Rebuilding Together affiliates across the country – Lowe’s Heroes have served as revitalization partners in Denver, Philadelphia, Columbus, Nashville and St. Louis, helping create more prosperous communities and providing safer and healthier homes for residents. "We're happy to be out here helping a neighbor improve her home. Our Lowe's team has done a terrific job working together here and with the homeowner to make sure we end up with a safer and better home here before we leave." 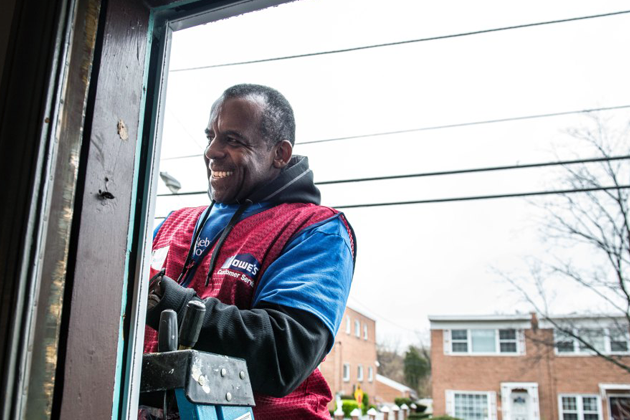 As we continue to rebuild homes and transform communities, we look forward to working with their dedicated employee volunteers, and having the signature red vests of our Lowe’s Heroes on even more projects nationwide. St. John is an inner suburb of St. Louis, Missouri. The residents there earn $35,000 on average per year, roughly $10,000 less than the average in the state of Missouri. Though some community development grants have helped improve the retail and commercial buildings, many low-income residents struggle to maintain their homes on resulting in unsafe living conditions. On Columbus Day weekend of 2015, nearly 500 community and employee volunteers – including hundreds of Lowe’s Heroes – made accessibility modifications, weatherization and energy efficient upgrades and other major home rehabilitations for 14 St. John homeowners, many of whom have been a part of the greater St. Louis community for their lifetime. Volunteers also transformed a vacant lot into a vibrant community space for all residents to use, complete with birdfeeders, a footpath and a fountain. Read more about Building a Healthy Neighborhood 2015. Consisting of three projects spread over four months, Kickoff to Rebuild 2015 – a Super Bowl XLIX sanctioned event – culminated with a two-day rebuild project in the Fillmore neighborhood of Phoenix. On January 29 and 30, Lowe’s Heroes joined volunteers from other corporate sponsors to complete home repairs for three long-time Fillmore residents. In addition to home repairs, Lowe’s Heroes installed a new custom playground at Crisis Nursery, the Phoenix area’s longest serving children’s shelter.